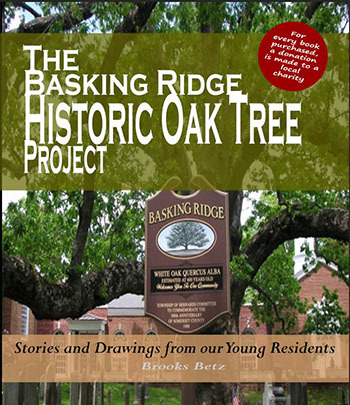 Following up on the successful launch of the Somerset Hills History Coloring Book, T3 Consortium, LLC has partnered with local organizations to present a new book entitled “The Basking Ridge Historic Oak Tree Project” a 146 page keepsake collection of artwork, stories, poems, and drawings from young residents of Basking Ridge. The book sells for $29.99. Up to $10 from each book sale will be donated. T3 Consortium has agreed to donate a portion of the proceeds to a local history scholarship fund. A special thanks to T3 Consortium’s Brooks Betz, Director of Systems Integration and Quality Management Services Group. To celebrate the 600-year life of the oldest white oak tree in North America, the children of Bernards Township have joined together to honor the historic Basking Ridge great white oak tree in writing and in art. The Basking Ridge Historic Oak Tree Project sought students from kindergarten through high school to participate in The Historical Society of Somerset Hills “Tree Views” writing contest and the William Annin Tree Shirt Contest & Fundraiser. The essay premise was that students would write as if they were the historic oak and describe events they felt notable. Every school in Bernards Township participated including Cedar Hill School, Liberty Corner School, Mount Prospect School, Oak Street School, William Annin Middle School, Ridge High School, and the St. James Catholic Elementary School. The tree shirt contest raised over $5440 selling tee shirts while the Historical Society presented a $500 scholarship to the High School essay winner. The Basking Ridge Historic Oak Tree Project was made possible with the support of a few noteworthy volunteers; Melanie Dupuis from the Bernards Township William Anne in Middle School, Meg Wastie, Trustee at the Historical Society of the Somerset Hills and Brooks Betz, the book editor and program chair at the The Historical Society of the Somerset Hills. All of them volunteered their personal time to create the programs and worked with the children that created this most memorable collection. A thank you also to Kristin Fox, the Bernards Township Public School K-12 Social Studies Supervisor for her coordination efforts and continued support. Lastly, thanks to The Historical Society of the Somerset Hills (THSSH) and the Basking Ridge Presbyterian Church (BRPC) who have been iconic anchors to our community and supported this effort. Initially the book will be sold locally exclusively thru The Historical Society of the Somerset Hills. After the initial release, The book will also be available online for those who cannot make the reception, or need to order copies that need to be mailed. 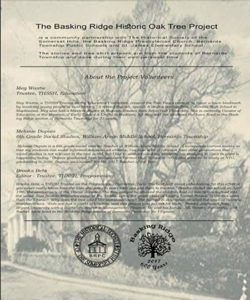 The Basking Ridge Oak Tree Project book is 146 pages in full color, 8 1/2″ x 11″, weighs approximately 12 ozs. and sells for $29.99. Up to $10 from each book sale will be donated. T3 Consortium has agreed to donate a portion of the proceeds to a local history scholarship fund.